Fortnite’s getting a new boxed retail edition just in time for Christmas, but it won’t launch with the original version of the game. Epic announced the Fortnite Deep Freeze bundle earlier today, which comes with cosmetics and in-game currency, but I felt like there was something missing. The Deep Freeze bundle will be on sale for $29.99 (around £23). It comes with 1,000 V-bucks (Fortnite’s in-game currency) which would set you back about $10 if you bought them in the game’s store. 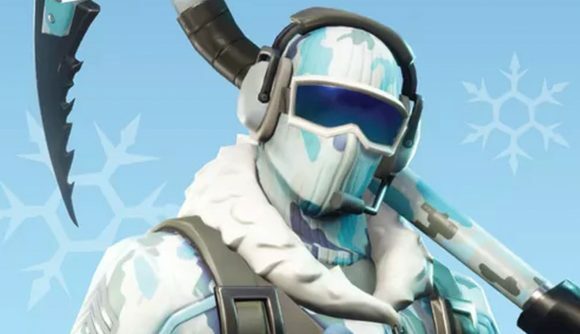 There’s also the cosmetics – a skin, a pickaxe, a glider, and some back bling, all decked out with the Deep Freeze’s arctic camo vibe. Now, I can’t state how much monetary value those cosmetics have. Rarity means a lot to Fortnite fans (as exhibited by the popularity of the Fortnite Skull Trooper skin), and it’s likely that the Deep Freeze cosmetics will only ever be available with this bundle. I will point out however, that the skin is basically a recolour of the pre-existing Raptor skin, and you could attach a similar critique to the glider. Deep Freeze does, of course, come with a download of Fortnite Battle Royale, but given that that’s currently free-to-play anyway, I don’t really think it counts. What surprises me, however, is that Epic has chosen not to include Save the World as part of the only retail version of the game to appear since its original release last summer. When we contacted Epic, a spokesperson confirmed that the bundle would not include Save the World, which currently goes for $39.99, but has seen a few 50% reductions over the past year. Sadly, if you’re a PC player, you won’t be able to get your hands on Deep Freeze – the bundle is only available on console, and as mentioned above, I don’t expect the cosmetics will ever arrive in the item shop – you’ll have to be content with all the other Fortnite skins instead. The Fortnite Deep Freeze Bundle will be available in stores on November 13, so you’ll finally be able to own a physical version of the battle royale later this year.